When you are using Mass Observation Online the easiest way to find material regarding the NHS is by clicking on the “Popular Searches” button near the top right-hand side of page and then under the “Organisations” tab click on “National Health Service”. This online archive is a fantastic resource for anyone interested in the everyday life of British people during this period of immense change. You can access Mass Observation Online and other primary source databases the Library has access to via Primary Sources databases list. Newspapers have always had a lot to say about the NHS and you can track coverage of the NHS from pre-1948 right up to the current day through the large number of online newspaper archives the Library subscribes to. Read full text articles, compare how different newspapers were covering the same issues and stories and see what events were being reported on at the time and how they were being reported. Daily Mail Reporter. 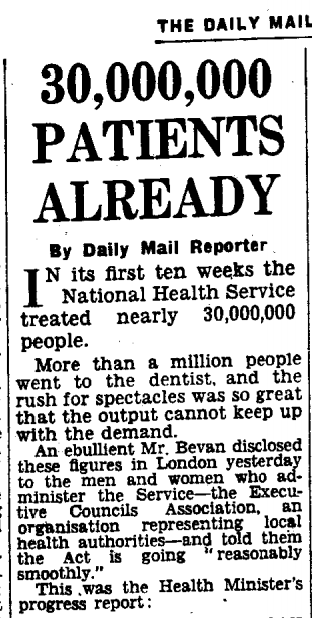 “30,000,000 Patients Already.” Daily Mail, 8 Oct, 1948, p. 3. Available from Daily Mail Historical Archive, 1896-2004. You can search individual titles, such as The Times, The Guardian and The Observer, Daily Mail, The Scotsman, etc., or cross-search a large range of titles, such as British Library Newspapers (that covers both local and national papers) or UK Press Online (which covers popular or tabloid press). All online newspaper archives available via the Library can be accessed from the Newspapers & Magazines database list. From this list you can also access magazine (periodical) archives which, like newspapers, can be a rich resource for historical research. Want to look at more recent coverage of the NHS? The Library also subscribes to databases, such as Factiva and Nexis UK, that allow you to search and access the full text of a large number of UK and international newspapers from around the 1980s up to date. You can access these, the databases mentioned above and many other newspaper archives and magazine archives from Newspaper & Magazines Databases. What to watch – then and now? BFI InView allows you to find and view over 2,000 non-fiction film and television titles from the 20th century to the early 21st. Selected from the British Film Institute (BFI) National Archive the database allows you to explore and download rarely seen government films, written documents, newsreels, TV documentaries, discussion programmes, parliamentary recordings and much more in an indispensable resource for any study into the recent history of Britain. 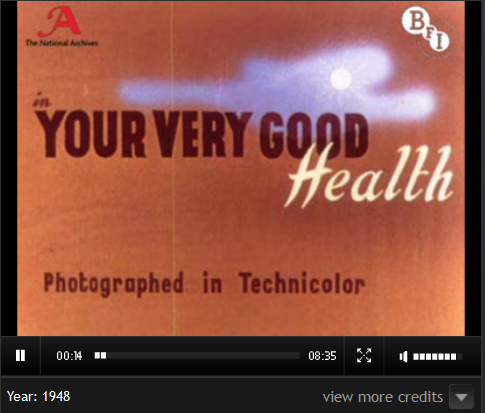 Screenshot from ‘Your Very Good Health’, 1948. Available from BFI InView. Through BFI InView you can watch public information films, documentaries, interviews, etc., related to the NHS from 1948 until 2002. 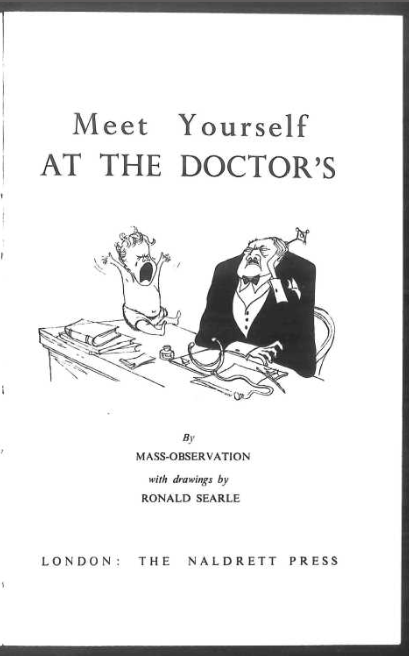 This includes early government films promoting the NHS and explaining how people should use the service, like Your Very Good Health a cartoon featuring the character Charley explaining how the new National Health Service operates and the benefits a free at the point of delivery health service will offer to everyone in England or Hospitals For All a film reviewing Scotland’s various hospitals, part of the new National Health Service. The BBC has been showing a number of programmes as part of a season on the NHS’s 70th anniversary. You can catch-up on these via Box of Broadcasts (BoB). Why not look out for The People’s History of the NHS a crowd-sourced social history of the NHS, told through people’s treasured mementoes, whether they be the unsung medical heroes of the staff or the experiences of the patients? Or UK Confidential: The Birth of the NHS from Radio 4 where Martha Kearney examines the battles and compromises that went on behind the scenes, in the lead up to the NHS creation. Or if you’re looking for something a bit shorter Radio 4’s series National Health Stories where medical historian Professor Sally Sheard presents a series tracing decisive moments in the life of the NHS, starting with episode 1, ‘Poor Treatment’, looking at how the British public coped before the NHS, with basic treatments and kitchen table surgery. You can access BFI InView, BoB and other moving image databases from Image and moving image databases. What’s in the Library’s own archives? The University of Edinburgh holds world class collections, including rare books, archives and manuscripts, art, historical musical instruments and museum objects. The Centre for Research Collections (CRC) on the 6th floor of the Main Library is your gateway into these unique collections. The Lothian Health Services Archives (LHSA) are part of the University’s collections. LHSA holds the historically important local records of NHS hospitals and other health-related material. They collect, preserve and catalogue these records and promote them to increase understanding of the history of health and for the benefit of all. LHSA have fantastic material related to the NHS and pre-NHS and are a must for anyone interested in history of medicine, public health, etc. Dawn of a New Era is the LHSA’s free exhibition on the 6th floor, Main Library, celebrating 70 years of the NHS in the Lothians. 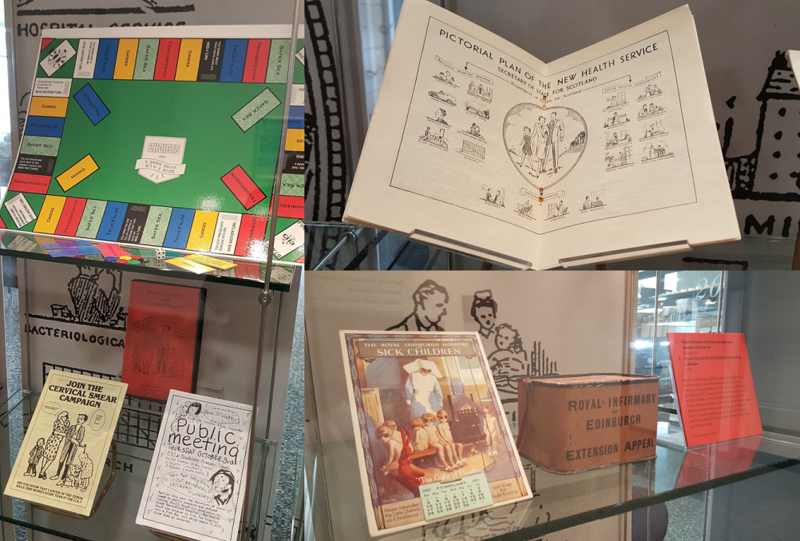 From Scotland’s pre-1948 experiments in state health care, to medical breakthroughs, public health challenges and patient power, this display highlights the past 70 years of our region’s medical history through the collections of LHSA. The exhibition runs until mid-August 2018. The Library has access to a large range of primary source databases that allow you to search for and view primary source archive material online. Here are just a few you may want to use to find more about the history of the NHS. 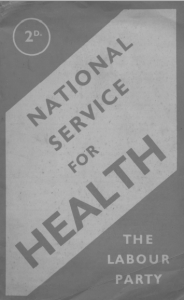 National Service for Health. The Labour Party, n.d. From World Communism: Pamphlets from McMaster University (Archives Unbound). Archives Unbound presents topically-focused digital collections of historical documents. There are currently 265 collections in Archives Unbound covering a broad range of topics from the Middle Ages forward-from Witchcraft to World War II to 20th century political history. As Archives Unbound covers such a vast range of subjects and collections, searching through the whole database is very worthwhile as you may come across useful material in collections you did not expect but you can also browse and search the individual collections. The House of Commons Parliamentary Papers (sometimes referred to as UK Parliamentary Papers) contains bibliographic records and searchable full text for papers printed between 1688-2014 and it also includes Hansard 1803-2005. It’s a really rich and detailed primary source for Britain, its colonies and the wider world and are an important part of the world’s historical record. 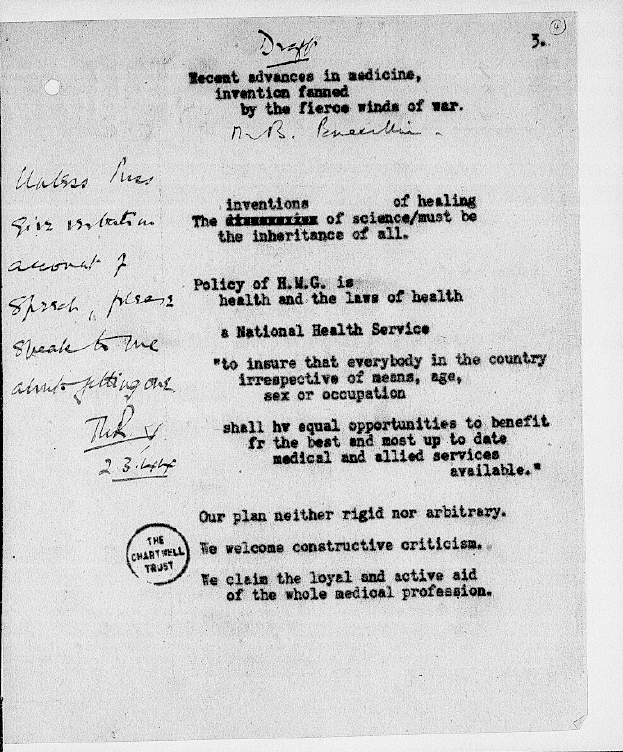 Screenshot of 1st page of partial speech notes for Winston Churchill’s speech on advances in medicine and science to the Royal College of Physicians, London. 2 March, 1944. Part of larger file CHAR 9/204A-C. Churchill Archive. You can access these and other primary source databases the Library has access to via the Primary Sources databases list. This entry was posted in Library, Online resource, Primary sources and tagged 20th century, 21st century, archives, Britain, cultural history, Databases, diaries, film, History, Lothian Health Service Archive, National Health Service, newspapers, NHS, official documents, primary source, radio, social history, TV by cstirling. Bookmark the permalink.